I know most people seem to entertain around Christmas, but my very favorite time to give a party is the spring-time. I feel a lot of pressure to have the house all done up for the holidays in December, but the spring seems like a low-pressure time to have friends over. A few vintage dishes, some linen napkins, and fresh flowers, and boom you’re done! Well then there’s the cooking and baking or getting take-out. 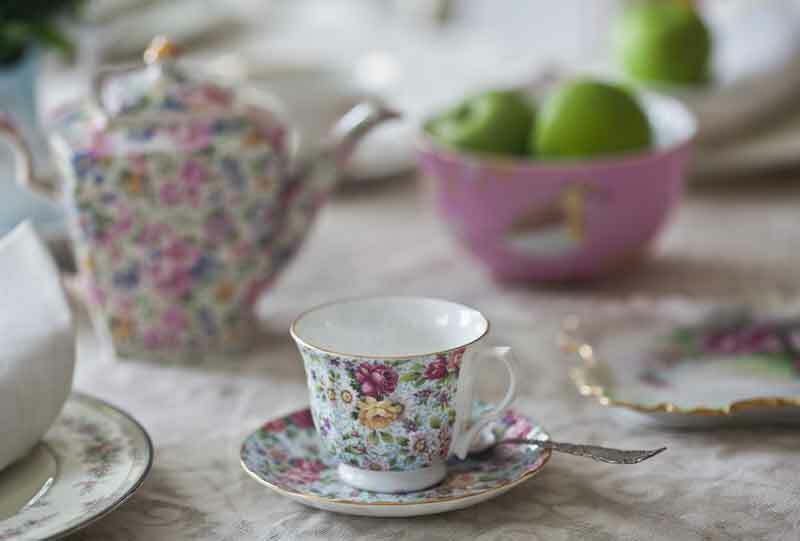 For this table-setting, each guest gets a unique teacup to use. They are all different. 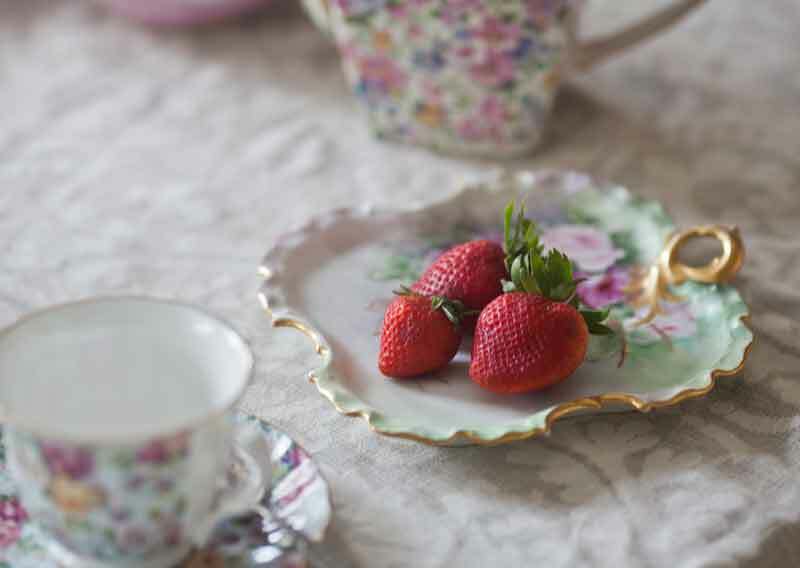 I’ve even mixed in some hand-painted pieces like this antique hand-painted dainty candy plate. This syrup pitcher is so pretty, I added it too. I decided several years ago to stop buying dishes, and I have really been good for a long time. I made an exception recently to purchase a few pitchers, since I use them to hold fresh flowers. 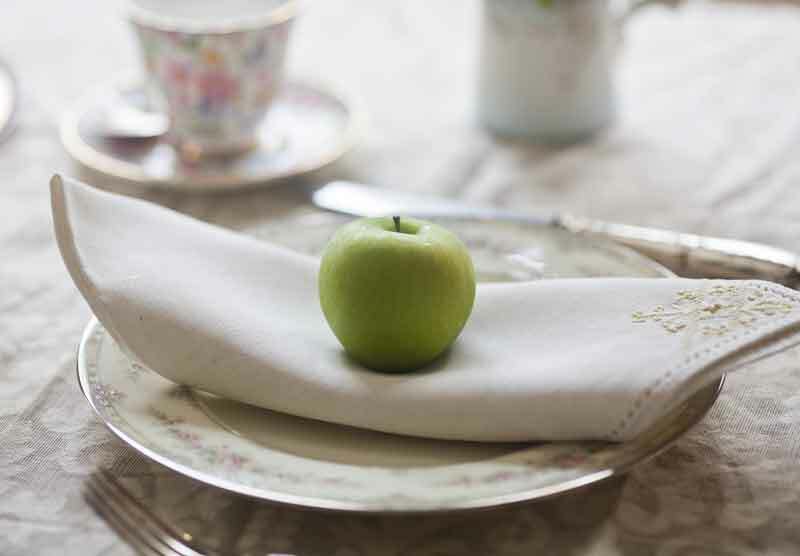 Green, tart Granny Smith apples give each place-setting a pop of color. 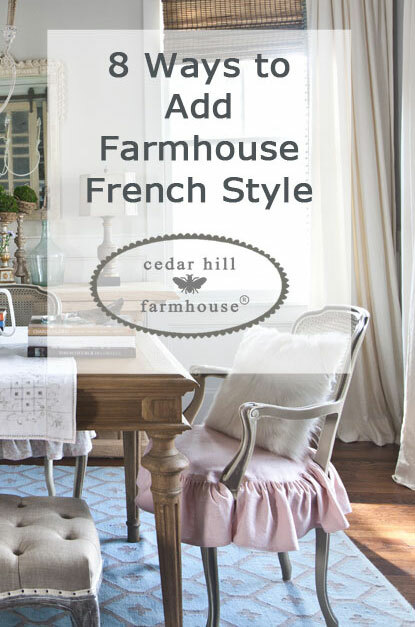 They sit atop Italian linen napkins from Round Top. 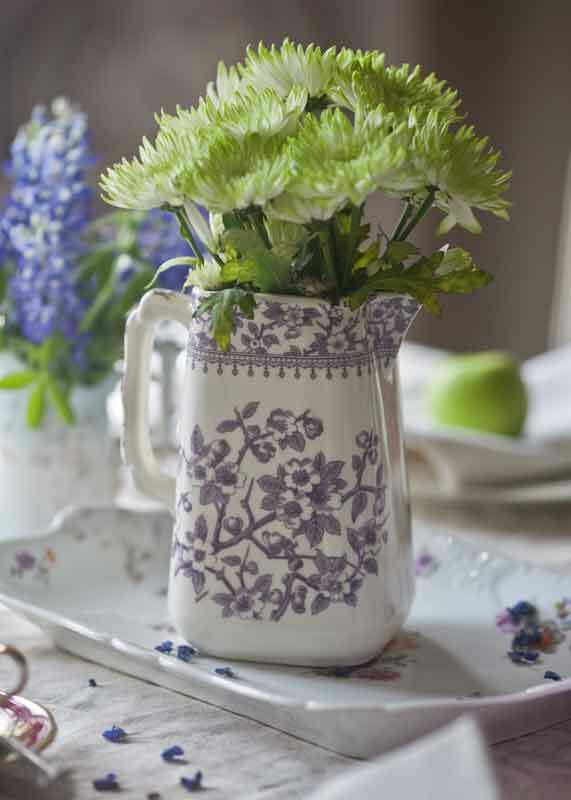 Another recent purchase, because I needed something for my flowers, I love this purple and cream pitcher. It looks like it’s antique, but it’s actually fairly new. And now I realize I got no close ups of the French silverware I used. There’s a secret I’ve been keeping from you this entire time. I feel a bit naughty not telling you. I like to always have a bit of a twist somewhere and my twist is that I used a curtain panel for a tablecloth. And see how it didn’t cover up the lovely detail on my antique French table? So if you are having company, and you are looking for a tablecloth, be creative! 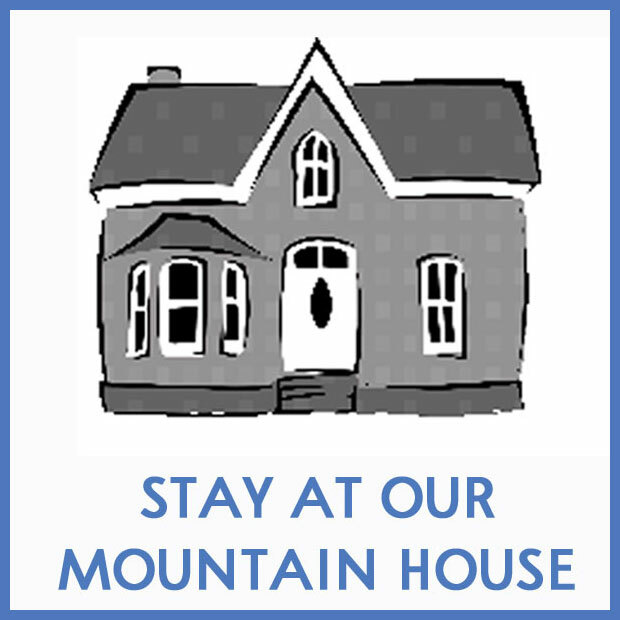 You could use a quilt or even a sheet. Often I buy fabric remnants and use them for tablecloths. And I love to use drop-cloth too. This tablecloth… errr.. curtain is courtesy of my wonderful sponsor Heritage Lace. 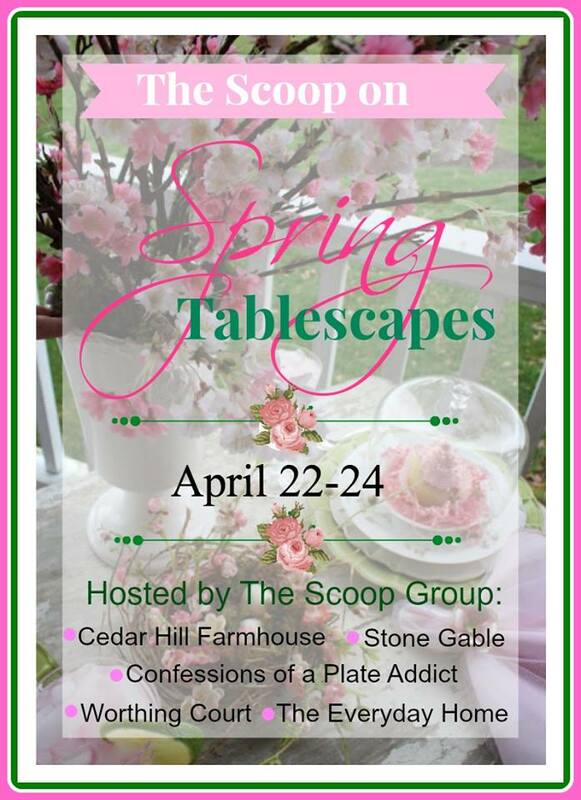 I sure hope you’ll visit the other blogs that are joining me on a Spring tablescape event. Your table is so lovely with your beautiful, dainty cups and saucers and pitchers of flowers. I also love how easy it is to entertain this time of year. Wonderful inspiration, Anita!! well would you look at that. i never would have thought to use a curtain panel for a tablecloth. love that idea and your beautiful table. What pretty pieces… Such a beautiful table Anita. Curtain panel… genius! I love all the beautiful dishes and the way you put it all together! 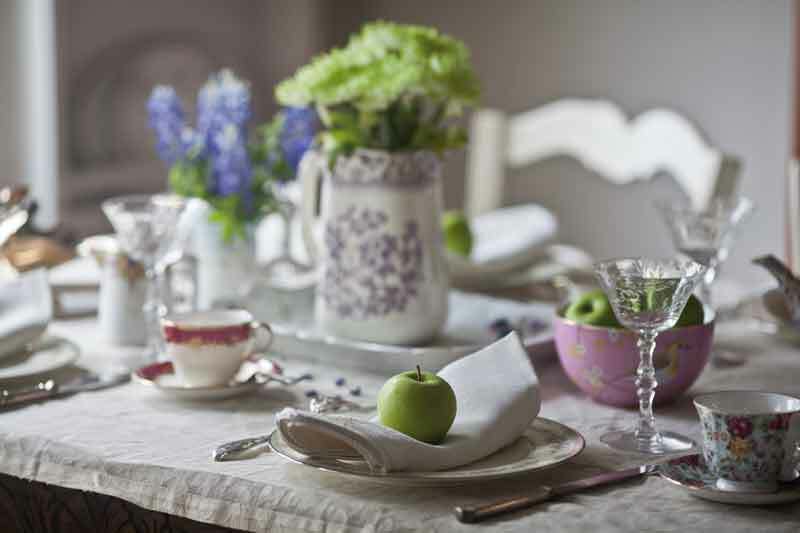 Simply beautiful – just love all the pretty dishes and the tablescape. I also love Spring, it’s so refreshing after winter. Had Easter dinner on the patio and it was wonderful – a renewal to life. So light and airy for Spring – I love your tablescape! 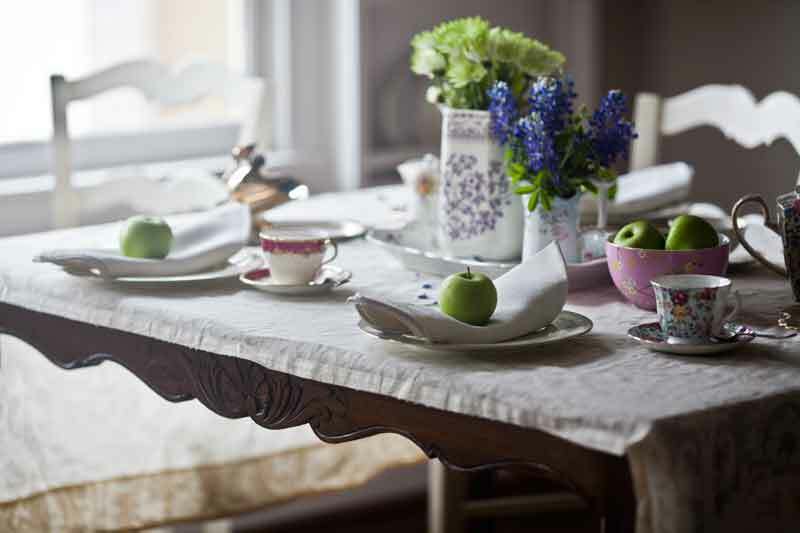 My favorite things – the pop of green from the Granny Smith apples and the curtain panel you used for your tablecloth! This has been such a fun party! Anita what a pretty and relaxing table you have set. Your collection of pitchers is amazing and not a bad dish collection either. I adore the unique cup and saucer for each place setting! Makes a guest feel as if you’ve chosen one “just for them”. Love the use of pitchers for things other than syrup, milk or cream! Very pretty, Anita! 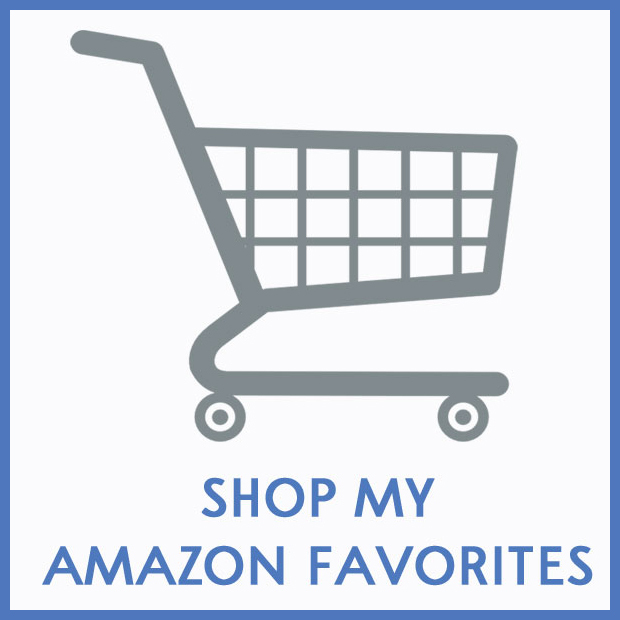 I use shower curtains, curtain panels, quilts, anything that fits! :). The table I posted tonight was a remnant from Duralee, a designer fabric outlet. $1! 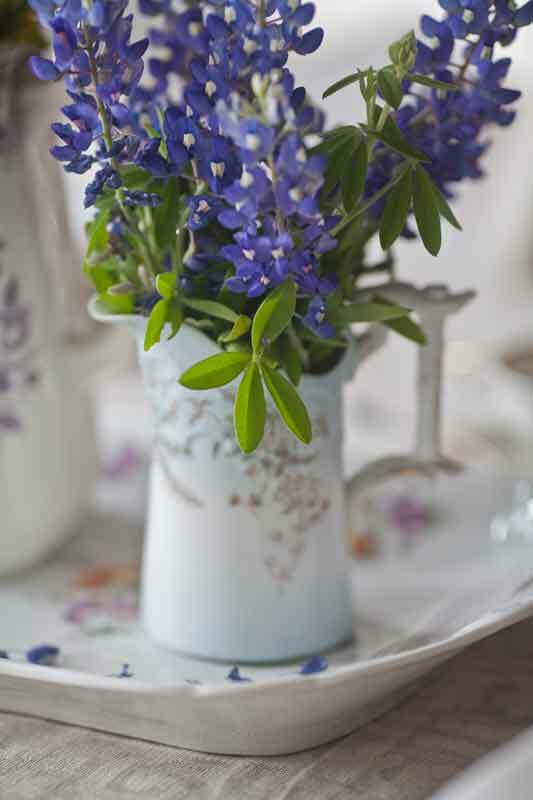 Of course, my favorite part of your beautiful spring table is the pitcher of bluebonnets. Everything is lovely. 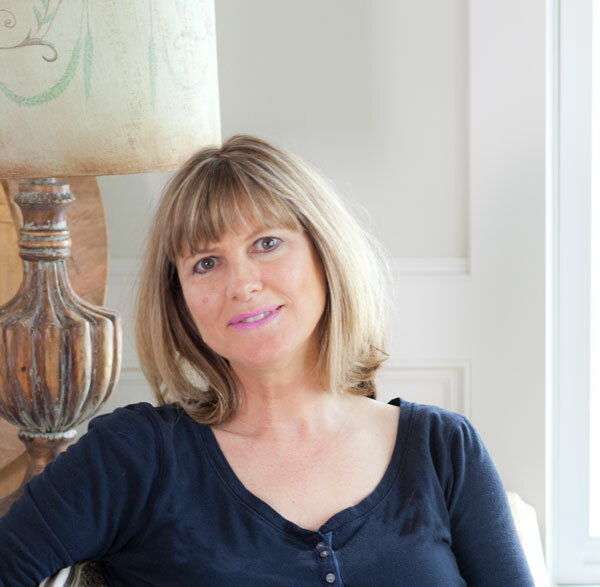 Excited to be part of the Spring Tablescape tour with you this week… All of the settings are pure inspiration. What a lovely table. I love mixing dishes. I am wondering if that little syrup pitcher is Nippon. I love Nippon and this look so like it might be with the gold beading around the top. Just curious. As always, it’s just gorgeous, Anita! I love all of your pretty dishes. And, of course, who doesn’t love Bluebonnets? They are my favorite part of living in Texas! Love the tablescape. I have many teacups also, and frequently use them when my friends come over. I also have used drapery panels for tablecloths. It’s fun to be resourceful! very similar to yours. Guess where i will be going tomorrow? It’s a cute way to serve fruit for one’s guests. 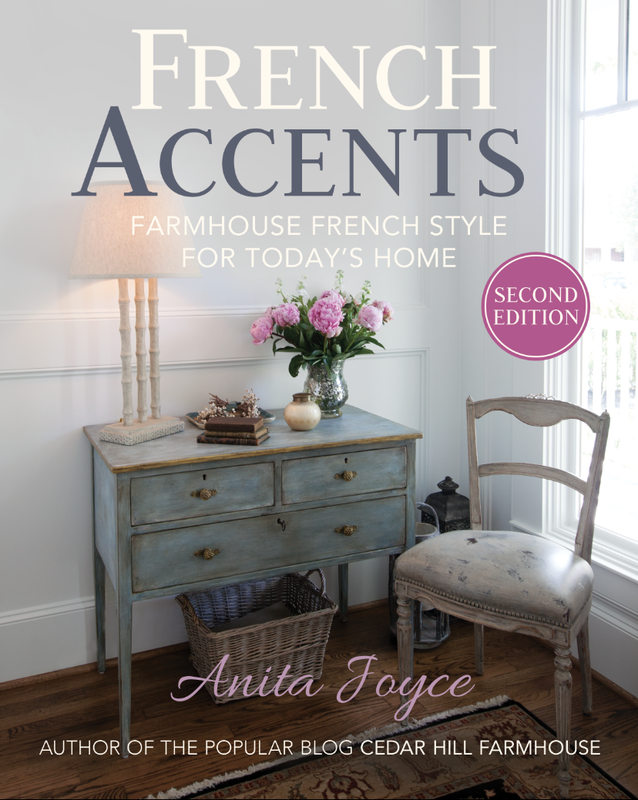 So beautiful and so French inspired! You are a smart one to use that lovely vintage curtain panel! I adore your little pitcher with the tiny cluster of blue flowers. I have a thing for pitchers! I feel as if this table could have been set in FRANCE! You are the best! Love your mixed china! So very charming! How clever to use a curtain! I’ve used fabric pieces before, or pillowcases as placemats. So nice to see your twist. Dear Anita, Your table is soft and feminine. Looks to be the perfect table for a cup of tea with friends. I love your tablescape and all the pretty pops of flowers on all of your dinnerware! 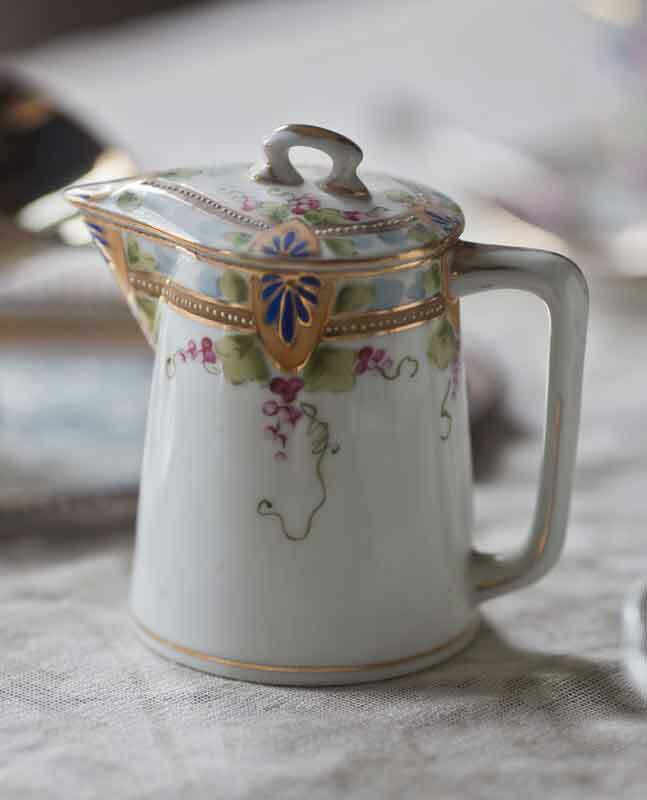 I love chintzware too! It’s been so much fun to party with you again Anita! Happy Spring! Your table is beautiful! So glad to be on the tour with you! Love all the pretty florals, Anita! So romantic! 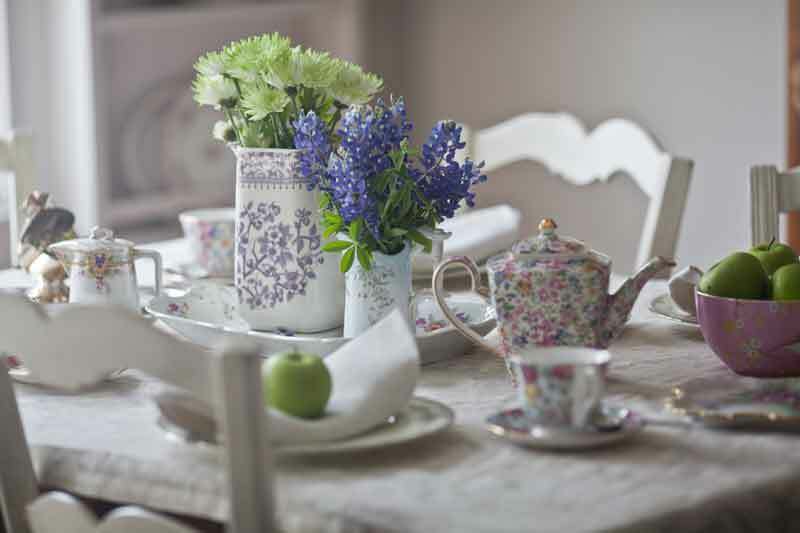 What a delightful table setting, very spring like and I do love the pretty vintage china. Gorgeous photos, I shall be pinning away. 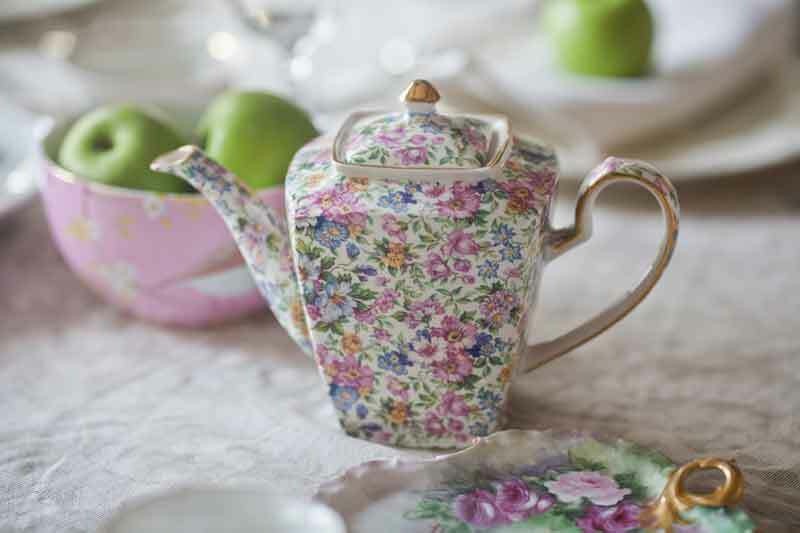 I love your table setting and it makes me want to have an afternoon tea at my home! I often would invite friends for a theme luncheon. Maybe a wine tasting or a chocolate feast. I haven’t had one in a long time. Been so busy with work, my Etsy shop and grandkids! Time to have another get-together with the ladies! You inspire me! 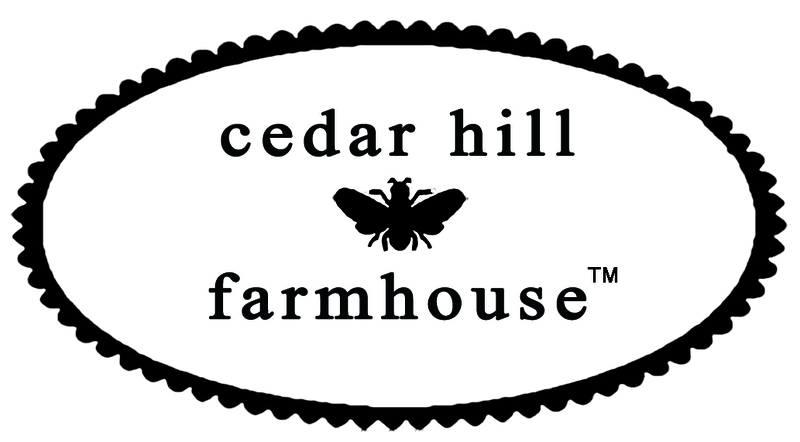 In today’s email (but dated April 23rd) there is mention of Italian Linen Napkins purchased at Round Hill. I have searched the web and see nothing by this name. Would you be kind enough to send website to me? Rochelle, the top post is always the post of the day. 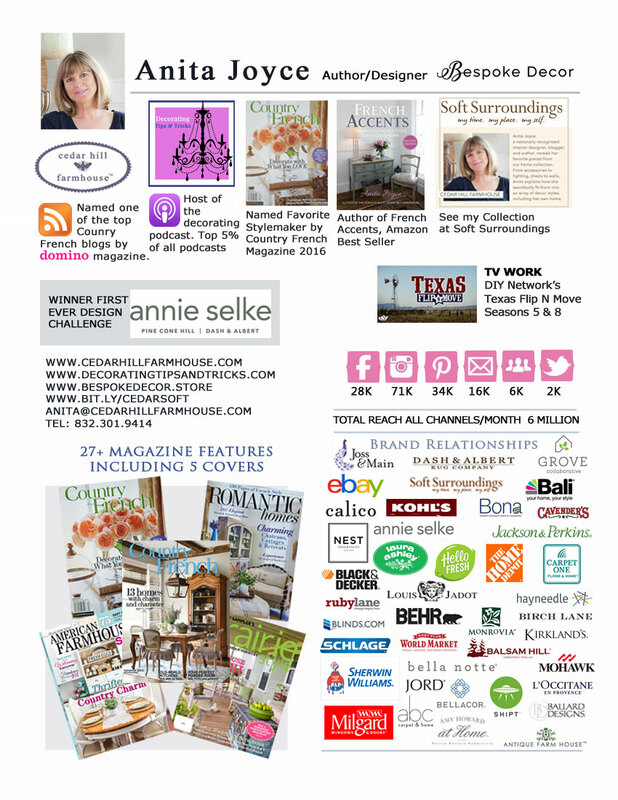 The other two posts at the bottom of the email are older posts are a few of my favorites that we hand select for readers to go with the post of the day. The napkins are from the Round Top antique week. There is no website, it is a large venue with miles and miles of vendors. Most of the vendors do not have a website and I don’t even know who I actually bought those from.